After all you great people submitted lots of feedback and really good ideas we went back to reconsider some of the fundamental bases of AGANTTY and came up with this new version. You can now add tasks individually for each project without worrying about the team that is assigned to it. 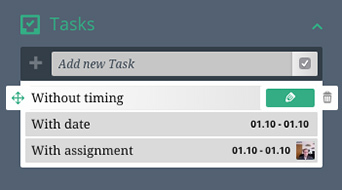 With this big change you can now also add tasks without a timing. Just deactivate the „autoscedule“ checkbox and you’ve got yourself an easy checklist within your project. 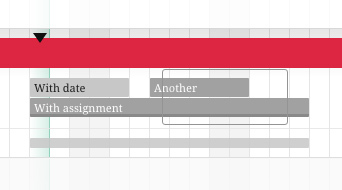 Of course you can still add them to a specific date with an easy drag and drop into the gantt chart. 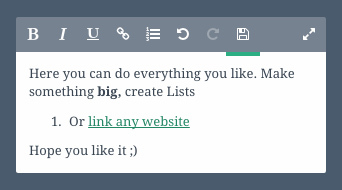 We’ve added a wysiwyg-editor with lists, links, re- and undo functionality for your projects and tasks. Now you can really describe your stuff in detail. Now you can select multiple tasks, deselect some of your selection with Shift+click and rearrange, assign or reassign them as you like. Just click and hold your mouse and check all the stuff you want to change. 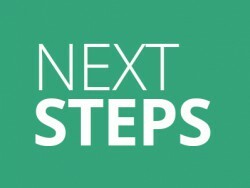 The Add Project as well as the project and task-masks are redesigned to make it easier for you to change what you need. The assigned tasks are sorted chronologically so everyone sees directly what’s up next. Thanks to all of you for your great ideas.